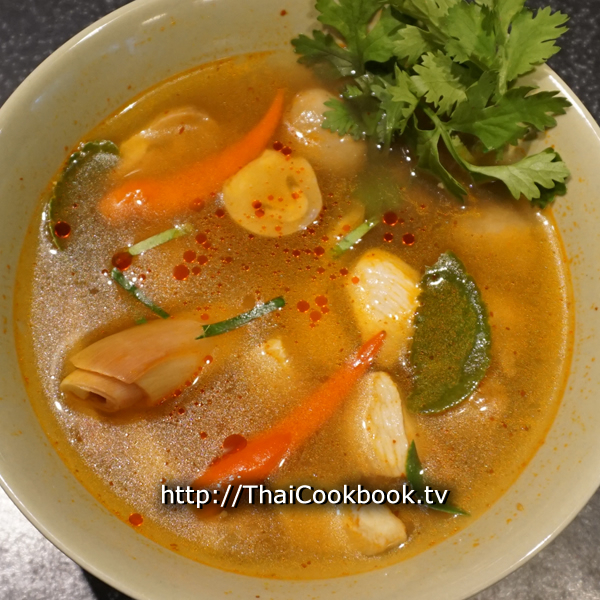 This traditional and authentic Thai chicken soup recipe, known here as Tom Yum Gai, features big chunks of low fat chicken breast meat and mushrooms in a spicy and herbaceous broth flavored with lemongrass, galangal, and kaffir lime. 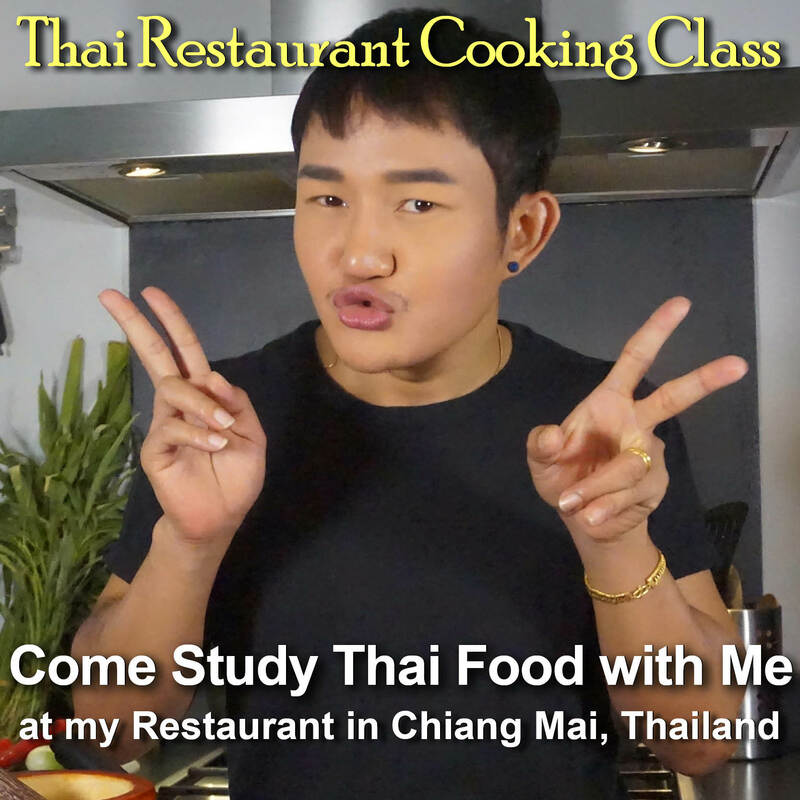 One of the things you will come to appreciate, with a little practice, is how easy it is to make Thai soups for one or two people without much fuss or mess. 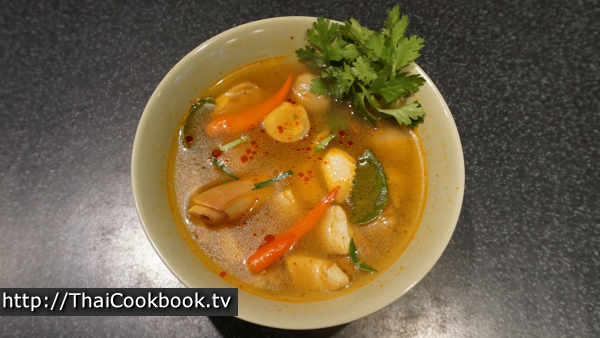 Unlike most soups in western cuisine, when you order a bowl of soup in a Thai restaurant it is nearly always made to order, so our recipes are perfect for making one bowl of soup, rather than a whole pot of soup. 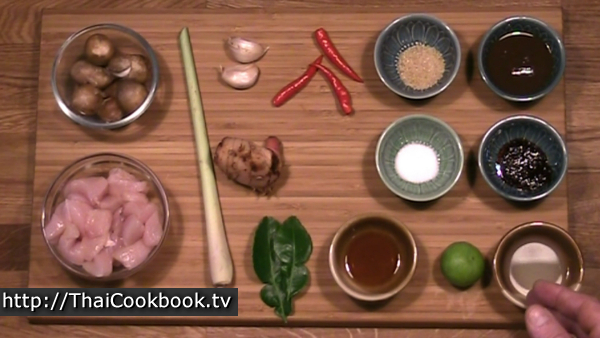 Follow along as we show you how to hand-craft the perfect bowl of Tom Yum Gai. What's in our Spicy Chicken Soup. How we make our Spicy Chicken Soup. 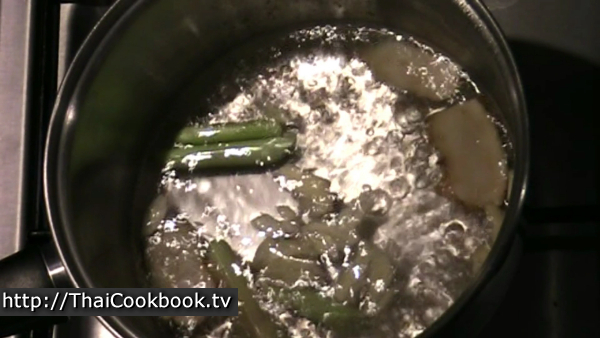 1) Boil lemongrass and galangal in 2 cups of water for 5 minutes. Add garlic and hot chili, and continue boiling for another minute. 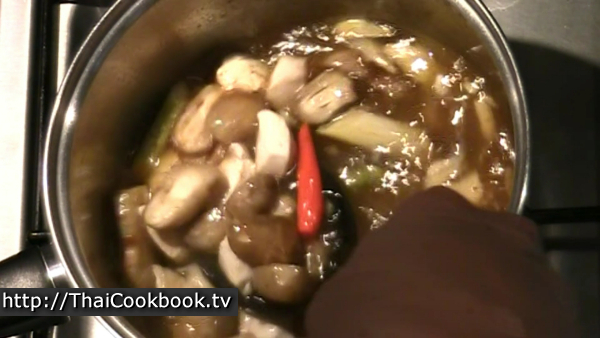 2) Add the chicken, mushrooms, kaffir lime leaf, and nam prik pao sauce. Boil for 2 - 3 minutes or until the chicken is cooked. 3) Add tamarind paste, lime juice, fish sauce, and sugar. 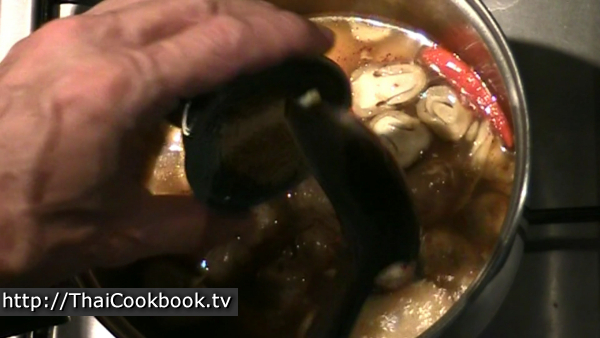 Stir in well and then taste the soup for the right balance of flavors according to how you like it. Add more of each as needed until you like the way it tastes. 4) Serve in a small bowl. Garnish with kaffir lime leaf and coriander tops. Serve with steamed rice. Prepare the ingredients by cutting the chicken breast into chunky bite-sized pieces. Cut the straw mushrooms in half. Squeeze fresh limes to get about 3 tablespoons of juice. Measure and have ready the sauces, salt, and sugar. Peel and crush the cloves of garlic. Slice 2 - 3 large pieces of galangal, about 1/4 inch thick. Cut the very bottom root portion and the top green part of one stalk of lemongrass away and discard them. Then cut what you have left on a diagonal into 3 or 4 pieces. Lay the pieces out and hit them with a pestle or the handle of a heavy knife to break them open just a little. Peel the center stem out of 1 or 2 kaffir lime leaves and discard it, tearing the leaf into 2 or 3 smaller pieces. 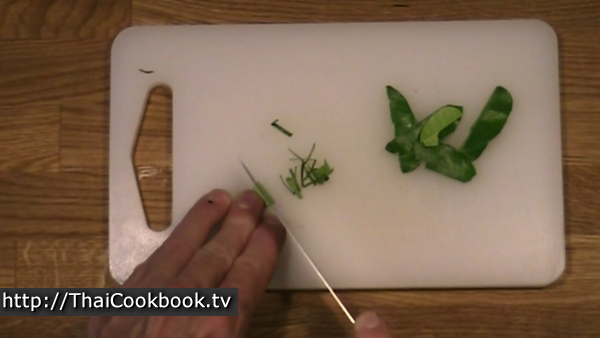 Slice part of one leaf into thin slivers to use as a garnish. Remove the stems from your hot chilies. Hit each chili lightly to release the spicy flavor without breaking them open, so the seeds stay inside. This is the method for a mildly spicy soup. If you want your soup very, very spicy, then chop the chilies fine. You can use more or less chili according to your tastes. 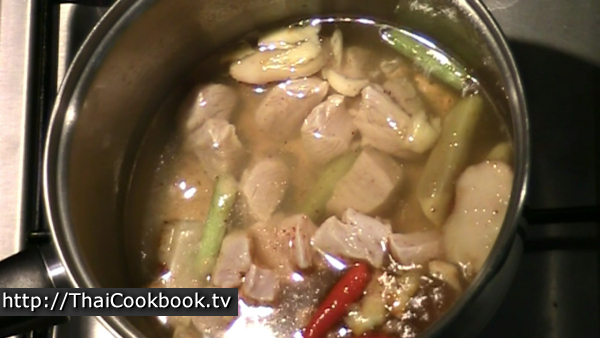 Boil the lemongrass and galangal in 2 cups of water for 5 minutes, then add the garlic, and chili. 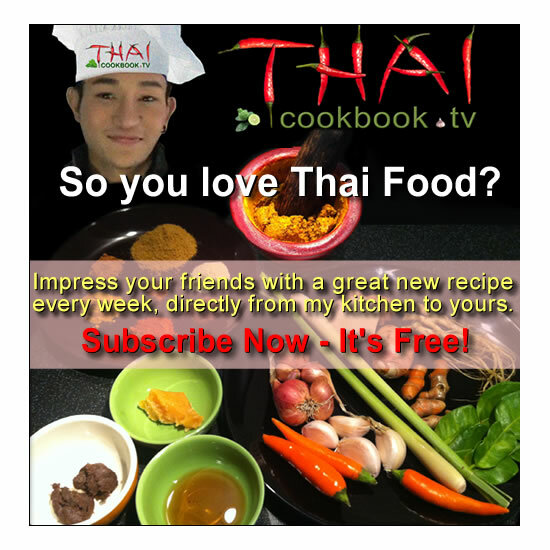 Continue boiling for about 30 seconds, then stir in about 1 teaspoon of Nam Prik Pao to start. This soup is seasoned to taste, so we may add more later. Add the chicken and stir it up well. Bring back to a boil. 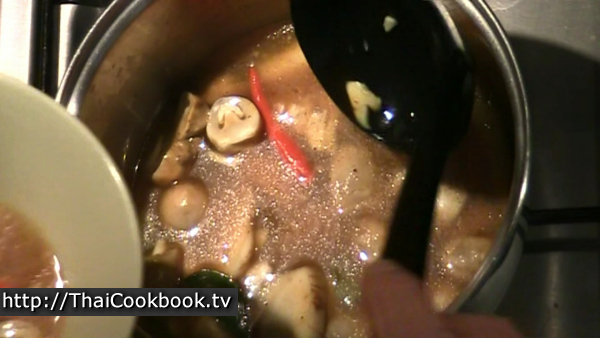 Add the mushrooms and kaffir lime leaf pieces, and continue boiling for about 2 minutes. Add about 1 teaspoon of tamarind paste, 1 teaspoon of sugar, 1 teaspoon of lime juice, and 1 teaspoon of fish sauce. Stir the soup well and continue boiling. By this point the chicken should be cooked. Turn the heat down and taste the soup. It should have a balance of spicy, sour, and salty flavors. Add more Nam prik pao, fish sauce, tamarind, and lime a little at a time until it tastes good to you, then it's done. Serve both servings in one bowl to be shared, or in two smaller bowls if you prefer. Sprinkle on some of the kaffir lime slivers and garnish with coriander leaves. Serve with steamed rice.